041. CAPT. ROALD AMUNDSEN. Issued by Hassan Cork Tip Cigarettes (American Tobacco Co.). (1914). Card unnumbered; from a set of 25 entitled "The World's Greatest Explorers". Size: Ca. 2.5" x 3.2". 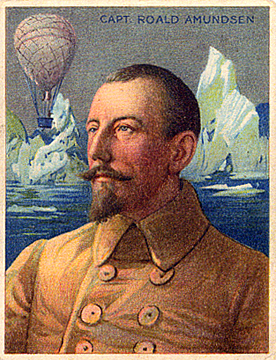 Recto: Portrait of Amundsen with icebergs and a balloon (!) in background. In upper right corner: CAPT. ROALD AMUNDSEN. Verso: THE WORLD'S GREATEST EXPLORERS | CAPT. ROALD AMUNDSEN | Captain Amundsen, the arctic, explorer who re-located the magnetic pole, was born in Norway in 1872, and entered the naval service of Sweden and Norway as soon as he was matured. He was so earnest and, efficient that he soon rose to the grade of second lieutenant. He explored East Greenland in 1901, and was a member of the Belgian expedition to the antarctic in 1897-99, serving at [sic] first officer. In 1903 he sailed through the Northwest Passage, and it was announced on a visit to the United States late in 1909 that in 1910 he would leave on a prolonged scientific expedition in those water to make nautical and scientific observations. He was to go equipped for a voyage lasting several years. --Albert Operti, F.N.A.G.S. | HASSAN CORK TIP CIGARETTES The Oriental Smoke. THE LARGEST SELLING BRAND OF CIGARETTES IN AMERICA. FACTORY NO. 30 2ND DIST. N.Y.